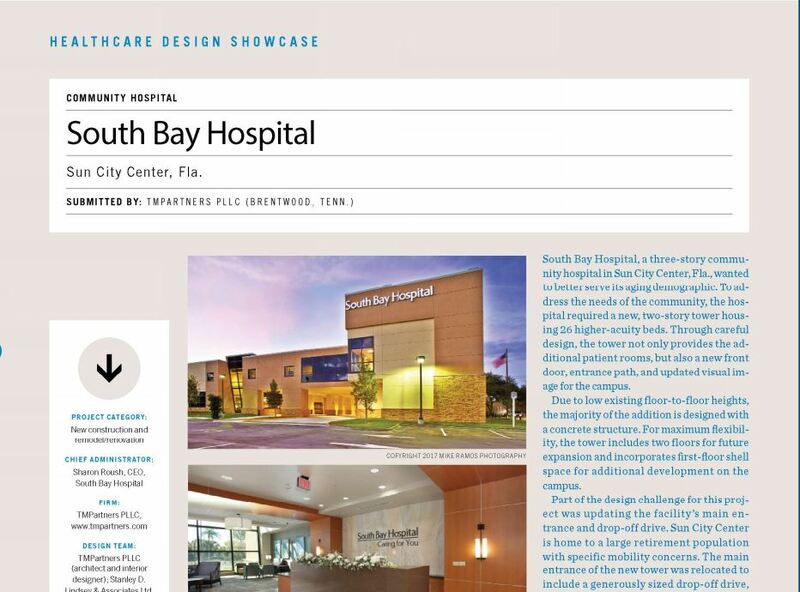 TMP project South Bay Hospital Renovations and Additions was honored to featured in Health Care Design Magazine’s most recent Architectural Showcase Issue. This marks the tenth year in a row that TMP has been featured in their showcase. South Bay Hospital, located in Sun City, Florida, a three story community hospital in Sun City Center, Florida, wanted to better serve the needs of their aging demographic. To meet this goal, the hospital required 26 higher acuity beds within a new, two-story tower. The new tower was carefully located to provide the additional patient rooms as well as update the entire front façade of the hospital, maximizing the impact of the addition. The tower also created a new front door and entrance path, aesthetically and functionally improving the entire campus experience.